As a journalist stationed for many years in Jerusalem, author Lesley Hazleton is not unfamiliar with religious research and writing. And yet intrigued with his story she continues her search. Laying out the story of Muhammad in biography form is not a simple statement of facts. The history of one of the most important religious figures in history requires an understanding not only of his background and development, but an understanding of how that background and development unfolded on a much different level with unpredictable results, and Ms. Hazelton takes this understanding through three separate sections. With this brief paragraph, she begins to unfold the story of Muhammad and the challenges he faced regarding his experience and its meaning. In Part One, Muhammad’s growth from childhood to adult is introduced as a child who is orphaned, yet not. His father dies before he is born, leaving his mother in the care of her father in law. This is a cultural responsibility, and she and Muhammad are seen as a burden. Muhammad is soon placed in the care of a Bedouin woman—a wet nurse, or foster mother. He grows to understand the ways of the Bedouin people better than his blood family, and when he returns to his family the reception is not warm. By this time he has skills valuable to the caravan leaders of Arabia, and as his life progresses, he hones these skills, further proving his value to his family. Yet his acceptance into the heart of the family remains elusive. Ms. Hazelton describes an event early in Muhammad’s life that points to mystical observances when a solitary ascetic seems to recognize that this young man was more than just a camel driver in a caravan. As he grows and matures, he experiences a vision on Mount Hira on a dark, quiet night in 610. His first reaction is one of doubt, believing it could not have really taken place. Through the encouragement of his wife Khadija who senses his extraordinary abilities he follows his religious directions. In Part Two, EXILE, Hazelton gives us several definitions of ‘exile,’ including physical, spiritual, and mental. The physical exile begins as Muhammad appeals to the community leaders for reform, to refrain from their lives of corruption and social inequity. Although the leaders believe they are honest, Muhammad sees their behaviors as anything but. Throughout this discussion, Ms. Hazelton follows the trail of Muhammad’s beliefs and his subsequent expressions as they take him from Mecca to Medina and back down a path of exile by his family and other clans. Spiritually, as his understanding of monotheism grows and he begins to gather a following, he finds himself in a two-year period of retribution from clan leaders who believe his teachings to be against their cultural history. His mental exile comes from certain self-doubt about fulfilling the role he is called to. In Part Three, LEADER, Hazelton takes us to the point where Muhammad enters the part of his life where he realizes the enormity of his achievement: the successes, the sadnesses, and the expectations for the future. Muhammad takes monotheism to its full awareness. He shows the true meaning of the Quran’s insistence on forgiveness of former enemies by forgiving his own enemies. The previous rejection of this man comes full circle after his exile, to accept his teachings as the word of one God: Allah. As Muhammad reaches the end of his life, Ms. Hazelton discusses his demise from two places: his concerns about who of the living will carry forward the truth of his teachings and the simplicity of manner in which he left the world. The First Muslim presents the periods of Muhammad’s life with both historical detail and Quranic quotes and their meanings relative to his life and teachings. This story is deep with details not only of Muhammad’s life journey, but with historic information about the culture of the times in Arabia. His passage from Mecca to Medina and back is filled with rich color of the locations, culture, and people; it is a book plentiful with tales of Muhammad’s life that follow logically from orphan to religious leader, but more than that, it enriches us with the detail of a time and place in history. 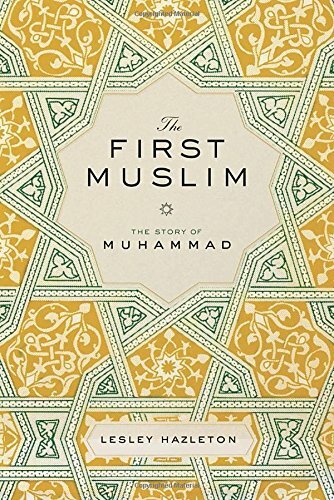 While this book is true to the history of Muhammad, The First Muslim is equally valuable to those who know little or nothing of Islam and its development as told through the experiences of the prophet Muhammad.